"This is a yummy, creamy version of standard pesto that makes a great spread for get togethers. Tastes great with pita chips or sourdough bread! Sun dried tomatoes may be mixed in for a zesty tang. Add crunch by coating the finished spread with almonds." 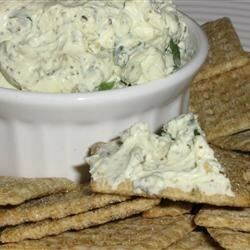 Place cream cheese and pesto in a food processor or blender. Blend until smooth. Mix in the chives and cilantro. Continue blending until smooth. Transfer to a mold lined with plastic wrap. Cover and chill in the refrigerator 1 hour, or until firm. It was just okay, I wasn't super impressed with this dip. I made it for a party and it wss not a big hit. Fantastic and very, very quick and easy. I used fresh parsley because I didn't have cilantro available and it was wonderful. I'll definitely make this again and again. Quick & easy. Although I did not like this, everyone else at the party loved it...even the picky kids. I think next time I'll skip the garlic. Thanks. Wow! Fantastic! This is very easy and very tasty. I need an appetizer for a potluck, and this is perfect.